We’ve said it all before — even when we know we really should keep at it. But despite having the very best intentions, why do we so often fail to honour our commitments, goals and responsibilities? Why do we struggle to maintain good habits, time and time again? The answer is because we lack a little thing called self-discipline: that thing that helps us overcome our weakness and limitations to do the things we need or want to do. Yep. 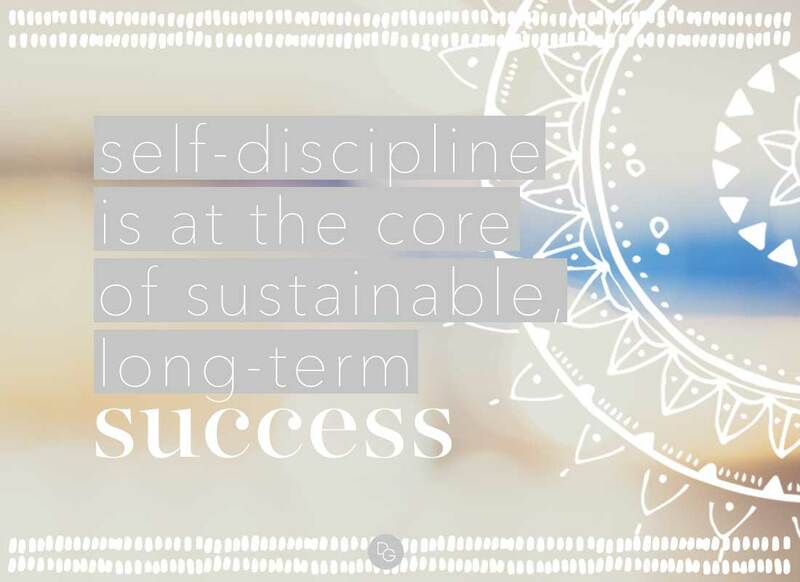 When it comes to our wellness, work, relationships and beyond, self-discipline is at the core of sustainable, long-term success. It breeds intense focus and allows us to overcome unsupportive emotions and behaviours and derail obstacles, distractions, impulses and cravings. That’s why today on The Daily Guru we’re sharing five easy ways you can master the art of self-discipline and in turn strengthen your resolve, establish and maintain healthy habits, release bad ones and exercise better control. Outta sight, outta mind — you know how the saying goes. It’s a really simple exercise, but identifying common distractions and hindrances in your environment and figuring out how to avoid, eliminate or minimise them is powerful way to help strengthen your self-discipline muscle. If you want to eat healthier, empty your fridge and pantry of unhealthy foods. What’s your poison? Social media, chocolate, shopping? Be proactive and delete it, bin it or steer clear. If you remove the temptation, you can redirect your energy from fighting or resisting to doing. Whether you want to finish writing that book, train for that marathon, quit sugar or save money, establish clearly defined, measurable goals and keep them front of mind. Write them down, visualise how it will feel to achieve them and review them every single day. Staying connected to your vision will remind you what you’re working towards in the moments when it’s hard to focus and stay on track — and will consistently drive you towards achieving it. Self-discipline is about taking repeated, consistent and incremental steps towards the bigger picture. So, once you’ve established your goals, it’s important to connect your daily actions and habits to this higher purpose. Set daily, achievable tasks, goals or milestones that will contribute to the bigger outcome. Commit to ticking them off, one by one. In isolation these tiny steps may seem inconsequential, but the sum of those parts are incredibly powerful. Sounds counterproductive, we know, but hear us out. You see, being militant, regimented and unforgiving about certain tasks can lead to burn out or a sense of deprivation, which can trigger self-destructive behaviour. Think about how you feel after a holiday. You feel replenished, recharged and motivated, don’t you? Apply this concept to your area of focus by carefully scheduling in breaks, rests or rewards and the path won’t seem so unrelenting. When left to our own devices it’s easy to talk ourselves out of something, postpone, defer, quit or cheat. We make excuses, tell ourselves we’ll start again tomorrow, or that it won’t hurt. Simply put, when we don’t have someone, or something pushing us, we stay comfortable. Declaring your goals to the Universe immediately sets an external deadline or expectation and makes you accountable to achieving them. Working to deliver or achieve what others expect of you will supercharge your drive to succeed. Get a support network around you — join a mastermind, hire a coach, get a mentor. Connect with someone who will check in with you, motivate you, encourage you to stick to your plan and remind you of your goals. Be bold and share your goals with as many people as possible: your friends, family, customers, colleagues or social media tribe. How do you struggle with self-discipline? Share with us in the comments below!